Winchester, Virginia is the oldest city in Virginia west of the Blue Ridge Mountains. 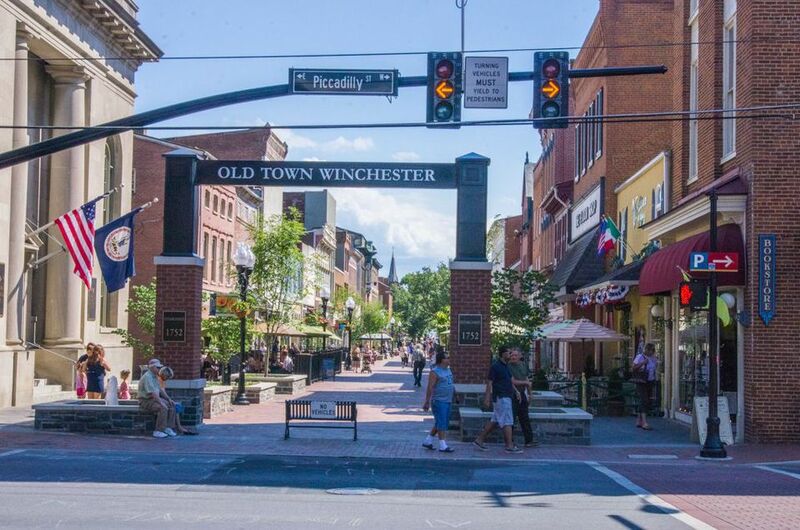 The historic district, known as Old Town Winchester, is a four block pedestrian only area with beautifully restored Federalist style architecture, unique restaurants, shops and historic landmarks. See the following photos and get a glimpse of the area. Abram's Delight, Winchester's oldest house dating back to 1754, was the home of five generations of the prominent Hollingsworth family. As an early settler, Abraham Hollingsworth built one of the first grist mills in the Valley and his home served as the area's first Quaker meeting house. Today, the property serves as a museum and is furnished with 18th-century art and antiques that tell the story of the early Shenandoah Valley settlers. A log cabin located on the west lawn of Abram's Delight Museum dates to 1780 and was reconstructed on the premises in 1967. The cabin is not the original structure located on the property but is similar in style. It is included in the tour of the main house. This statue of George Washington is located outside of the George Washington's Office Museum in Old Town Winchester, Virginia. George Washington used a small log building in Winchester as a military office while supervising the construction of Fort Loudoun at the north end of town. The building is now used as a museum showcasing the role that Winchester had on our first president's early military and political career. Shenandoah Discovery Museum is a children’s activity center providing a variety of interactive, hands-on exhibits and programs that focus on the sciences and mathematics, the humanities, and the arts. The museum is located on Loudoun Street in the heart of Old Town Winchester. Fort Loudoun served as the command center for the VA Regiment during the French and Indian War. The fort, named for John Campbell, Earl of Loudoun, was a square fortification designed by George Washington, commander of the Virginia regiment. This marker, situated between the sidewalk and fenced yard describes the fort and its historical significance. The Winchester City Hall building was built in 1900 with half of the funding contributed by native Charles Broadway Rouss. The Old Court House in Old Town Winchester was used as a hospital and a prison during the Civil War. Today, the historic site maintains a nationally recognized collection of Civil War artifacts and provides tours of the building. Handley Library is one of the most beautiful buildings in Old Town Winchester. The Beaux-Arts style building opened in 1913 due to funds donated by Judge John Handley of Scranton, Pennsylvania to build a public library. Union Jack Pub & Restaurant is located in the heart of Old Town Winchester in the historic Union Bank Building that dates back to 1878. The restaurant offers authentic British cuisine in a traditional pub atmosphere. This is one of many fine restaurants on the Loudown Street Walking Mall. The Museum of the Shenandoah Valley, located just outside of Old Town Winchester, showcases the art, history, and culture of the Shenandoah Valley. The museum complex also includes Glen Burnie Historic House and Gardens, the home of Col. James Wood, who settled on this land in the early 1700s and then donated portions of his property to establish the city of Winchester in 1744. Located on the grounds of the Shenandoah Valley Museum, the Glen Burnie Historic House and Gardens, offers self-guided tours of the six-acre gardens that surround the main house.